It won’t be long! Earthmen are fast removing all obstacles to me conquest of Interplanetary space* EARTHMEN have set their thoughts on the conquest of space. More than that, they have set their hands to it. In dead earnest they are committed, in both the Old World and the New. It now can definitely be said, the race to the planets is on! Most experts are agreed that the first unmanned guided missile will strike the Moon some day during the next ten years. The fist manned Moon rocket will probably follow within five years after that. But that trip will not include a landing; it will be merely a trip around the Moon, at a comparatively close but respectful distance, with return to Earth after circling it a few times. The best rocket fuels known at the present time will not allow more than that. Even a landing on the Moon with subsequent return to Earth seems to be somewhat beyond the reach of chemical fuels. It might be explained that the simplest way of expressing the value of a chemical fuel is to name the exhaust velocity which it will produce. The largest known rocket motors burn alcohol with liquid oxygen, and their exhaust velocity is about 7,000 feet per second. Considering that sound moves through air at the rate of about 1,000 feet per second, this is quite a high figure, though it is only about half the theoretical exhaust velocity of that combination. If you wanted to go only to the Moon, land there, do some preliminary surveying and research, take off again and return to Earth, you would need a ship which carries some 20,000 times as much fuel as its own dead weight. That, of course, is impossible. But there are a few more powerful chemical fuels. Let’s jump across the pages of the handbook of chemistry and look at once at the most powerful usable combination known to chemists—hydrogen burned with ozone instead of oxygen. This has a theoretical exhaust velocity of 18,500 feet per second. Actually an exhaust velocity of about 12,000 feet could be obtained if scientists and engineers knew how to handle that combination, which they don’t at present. Supposing they do learn, the space ship which is to land on the Moon and return to Earth still would have to carry a fuel load of about 150 times its dead weight, and that is impossible, too. Though this sounds gloomy, it probably isn’t very important. For the chances are that the engineers will never learn how to handle the hydrogen-ozone combination in a space ship, but that by the time the first chemically-driven guided missile crashes on the Moon, we’ll probably have the first rockets propelled by atomic energy. In July 1946 a new project was quietly started at Oak Ridge. Its name is NEPA, from Nuclear Energy for Propulsion of Aircraft. The purpose of the project is to investigate how atomic energy can be utilized for the propulsion of aircraft and rockets. No outsider knows right now how it can be done and it is quite probable that the insiders, at this moment, are not too sure, either. But in time they will emerge with an answer. One principle of that answer is clear even now. A rocket operates by burning a fuel with oxygen and by expelling the products of combustion. A nuclear energy rocket could not do that; it would not be allowed to consume valuable uranium or plutonium and throw out the fission products. These products would be fantastically fast, but they’d be too light in weight, and therefore inefficient. An atomic rocket would need something else to throw away, a kind of “filler mass.” Rear Admiral William S. Parsons stated recently that this filler mass could be hydrogen gas. The hydrogen gas, he said, would not be “burned” as a fuel, it would just be heated to very high temperatures by atomic energy—say something resembling, or rather derived from, a high-intensity pile—and expelled through the exhaust nozzles. Hydrogen is advantageous for this purpose from every point of view. The lighter the molecules of the exhaust gas, the better it lends itself to a high exhaust velocity. Hydrogen has the lightest molecule that exists. Hydrogen is also cheap and plentiful— being one of the main constituents of water—and if one has the necessary machinery for producing very low temperatures it can readily be liquefied and in that state is easy to handle. 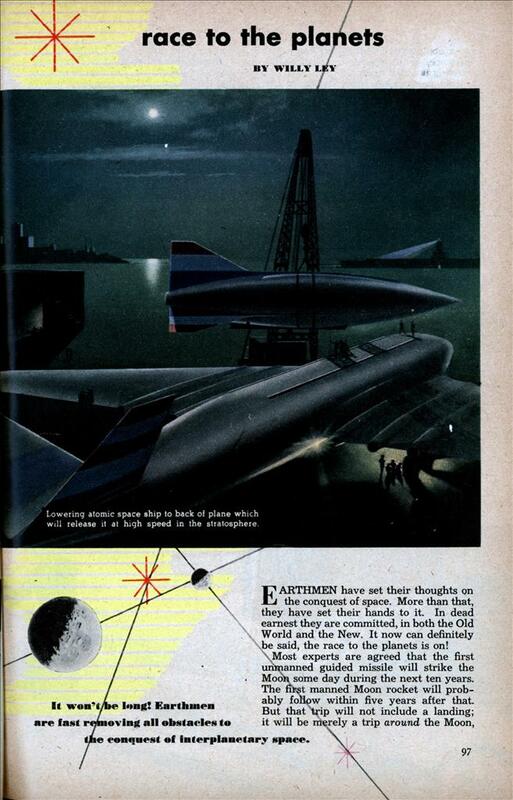 Supposing that the atomic engine is capable of expelling the hydrogen gas with a velocity of 65,000 feet per second (nine times as fast as the exhaust of a V-2 rocket), the moonship will need carry only about 2.5 times as much fuel as its own dead weight. The V-2 rocket now carries a little more than 3 times as much fuel as its own empty weight. This means that the moonship can be built without special difficulties, once the gentlemen of NEPA find a method of handling atomic energy for this purpose. And—it must be added— once they solve the difficult problem of protecting the travellers from the radiation which emanates from the atomic engine. Since the mass which is thrown out of the exhaust nozzles is hydrogen, that moonship could also go to Mars and back, provided that water can be found somewhere on the Moon. Astronomers do not like to commit themselves on this point, but-most of them seem inclined to grant the probability of water existing somewhere on the Moon, in the form of ice, of course. A well-stocked refuelling station for atomic space ships will carry slugs or bars of plutonium-rich uranium (carefully stored so as to be below critical mass), liquid hydrogen for the rocket nozzles to throw away, liquid oxygen for the travellers to breathe, and some minor items such as vitamin pills and frozen food. But if there is no well-equipped refuelling station, any body of water will do. In that case the ship will have to carry the necessary equip- ment for electrolysis of water, resulting in gaseous oxygen and gaseous hydrogen, and the equipment for liquefying these gases. The atomic powerplant can provide the necessary energy for these operations, while the low temperatures of the lunar night will make the job of liquefaction easier than it is here on Earth. Before we go on let’s have a look at the solar system, just as any traveller on Earth would have a look at the map before he sets out on a trip. We need to, much more than the surface traveller. Any island, however remote, to which he might want to travel, at least stays in one place—but our planets do not stay in one place. The case of the Moon is easy, for it moves along with and around the Earth in space. It would be possible to set out for the Moon at any moment. Things are slightly more complicated than they may seem at first glance, but the pilot of a space ship bound for the Moon does have the enormous advantage that he can see his target all the time. The navigator who is bound for Pit-cairn Island is not as well off. But if the ship is going to Mars things are different. All the planets move around the sun—fortunately all in the same direction and all about in the same plane—but they do not move with equal speeds. Mercury, innermost of the planets, is the fastest by far. Venus, which is next in line, is somewhat slower, Earth, which comes next, is still slower, and Mars, outside the orbit of Earth, is again slower. They all move in ellipses, with the sun in one focal point. The space ship also has to move in an ellipse with the sun in one focal point; but the ellipses which are the orbits of the planets are nearly circular, while that of the space ship orbit will be elongated— elongated enough to touch the orbit of Earth at one end and that of Mars at the other. Of course you can get a space ship into such an orbit any day you please, but that’s not enough. You don’t just want to touch the orbit of Mars, you want to touch the planet Mars at some predetermined point in its orbit. It’s somewhat like trying to meet a fleet which is going ahead under full steam. Your only advantage is that you know the planet’s course and speed; astronomers can tell for any hour for many years to come just where Mars is going to be. But we are getting ahead of the story. First the ship has to take off from Earth. It might be able to take off directly, but this would be impractical. The exhaust of an atomic-powered ship might be radioactive and therefore highly dangerous to the spectators; it certainly would be inefficient. The efficiency of a rocket motor increases as the speed of the rocket increases. In a space ship powered by nuclear energy the inefficiency would be really bad, just because it has such a high exhaust velocity. For these reasons it will be practical to carry the ship to a high altitude, say 50,000 feet, and there bring it up to a speed of some 450 or 500 miles per hour. More would be better, but that is about all one can get from a large jet-propelled carrier plane. At the highest altitude at which the carrier plane can fly at high speed, the rocket will separate from it—the plane getting out of the neighborhood of the dangerous radioactive exhaust blast as fast as possible. The exhaust will appear as a flame, for two reasons. The hydrogen gas will be heated to incandescence and look like a lance of light merely because it will be so hot. And the hot hydrogen will unite with the oxygen of the air and burn in the chemical sense. This will add precisely nothing to the propulsive power of the rocket, but it certainly will increase the spectacle, especially when seen against a night sky. The first job of the free ship will be to get out of the atmosphere which impedes its movement; therefore its nose will be pointed upward vertically or almost vertically at first, until it reaches a height of 80 miles or so, then it will be slowly depressed until the longitudinal axis is almost horizontal. This—for difficult mathematical reasons—is the most efficient method of getting a space” ship up to full speed. The result is a curve which has been named the synergy curve; it points east for highest efficiency in take-off. Once the ship has attained a velocity of 5 miles per second it cannot fall back any more. If necessary it could make a half circle around the Earth in order to point at the place in the sky where the Moon is due to arrive some 90 hours later. That would not take any fuel; but for many reasons the time of take-off would be so chosen that the synergy curve points in the right direction. Experiments with centrifuges have proved that a normal man with a sound heart can stand ten minutes of an acceleration of four gravities. The atom-powered ship will need only about eight minutes of such acceleration to have all the speed it needs to get to the Moon. It need only throw out a little more than 2\k times its own unfuelled weight of hydrogen gas, then it will not need active propulsion any more; its momentum will carry it to and across the line where the gravitational attraction of Moon and Earth balance each other; and from then on it will fall to the Moon, because of the Moon’s attraction, and it will have to resume power only to brake its fall and land. The spot for landing is one chosen because it is either known or at least suspected that there is water in the vicinity. If there is none, there will be enough hydrogen left in the tanks to return to Earth—a relatively simple matter because the Moon does not have the terrific gravity of our home planet. If there is water the tanks can be replenished with liquid hydrogen, however, and the really long trip begun. The Moon revolves in an orbit around the sun along with the Earth. Its speed is such that the attraction of the sun is just balanced. If the ship adds its speed to that of the Moon it will move too fast for the sun to hold it in this orbit, therefore it will drift outward in the solar system, away from the sun. Farther out is the orbit of Mars, and that planet too moves with just the speed which balances the attraction of the sun. Since there, farther out, the sun’s attraction is less powerful, Mars can move more slowly, and does. While the ship is coasting outward, the sun, of course, is steadily pulling at it from inward, and it is this pull which decreases the ship’s surplus speed, so that when it gets to Mars the speeds of ship and planet will very nearly match. Most of the trip from the Moon to Mars is again performed on momentum, just like the trip from Earth to the Moon. And, strangely enough, the trip from Moon to Mars does not require much more “throw-away mass” (hydrogen) than the trip from Earth to Moon. But it is going to take much longer. Just how long it takes will depend partly on the relative position of the planets, but mainly on the amount of fuel available. The maximum duration is 258 days for the trip; with some extra fuel expenditure this could be cut down to some 80 days. Most of the extra expenditure would be made when the ship comes close to the planet. The ship may have too much surplus speed when it gets there. Such speed would have to be reduced by rocket action, or the ship would overshoot its mark. We know that there is water on Mars. The blinding white polar caps of that planet, as seen in the telescope, prove it. But the fact that the polar caps melt completely during the Martian summer also proves that there is not very much water— a customary estimate assigning an average thickness of 2% inches. Still, what is very little water for a planet is a great deal for a space ship, even for thousands of them, so ithe problem of getting fuel for the return to Earth is easy, as far as the planet Mars is concerned. During the long drift outward the pilot of the space ship can establish his position well enough by means of astronomical observations, but when he approaches the planet closely these will not be precise enough. With the instruments which a space ship could carry, an error amounting to a few dozen miles could be expected. As long as the planet is a million miles away, such an error does not matter. Later it might become disastrous. But experiment has proved what was theoretically certain from the outset— that a radar set is a means of measuring distance in empty space as it is on Earth. We know what an exploring party will mainly find on Mars—sand. But we have no idea what else such a party would find. There are dark areas which once were taken to be seas. Now it seems much more likely that they are not seas, but either just darker areas, areas of ground darker than light-colored desert sand, or areas of vegetation. It seems quite certain that some of them are areas of vegetation. We still don’t know what the famous “canals” are. What we see might also be vegetation. There is no way of telling from this distance whether rows of stagnant pools are in the center of these possible lines of vegetation. Or what else. They might, they just conceivably might, be actual old canals, long broken down and useless. It will take a space ship to find out. The explorers will have plenty of time both to find out and to recharge their liquid hydrogen tanks. The reason is, the planets move. And that they move with different speeds. If the explorers decided to return to Earth after a week’s stay, they could easily return to Earth’s orbit— but the Earth itself would be a very, very, very long way from the point of its orbit which they would reach. To set out on the return trip at once would require either an ultra-powerful ship or a period of patient waiting. And since the first ship is likely to be under-powered rather than over-powered, a waiting period is indicated. In the most unfortunate case that waiting period would be 455 days, about a year and three months; but if there is some power reserve available, that waiting period can be cut down to only a few months, about the time which would be needed for purposes of general exploration. The ship, while waiting, could easily make exploratory trips to the two small moons of Mars, Phobos and Deimos, or to distant points on Mars itself, since the hydrogen these short trips would use up could always be restored. It is only the long drift inward through the solar system, the long drift home, which requires waiting and timing and hoarding of fuel supplies. The trip back will in one way be the same maneuver which got the ship to Mars, but in others the opposite of that maneuver. Mars, you remember, moves in its orbit with just the velocity needed to counterbalance the sun’s attraction. If it moved more slowly than it does, its speed would be Insufficient to counterbalance the sun’s attraction and it would begin to spiral toward the sun. When the space ship takes off from Mars it deliberately effects just that. The synergy curve will be pointed in such a way that the ship falls behind the planet and is, seen from the sun, slower than the planet. This being the case, the sun’s attraction wins out over the speed of the ship and draws it inward, in a long ellipse, and as the ship is drawn inward it moves faster and faster. Since we have talked about a surplus speed for the first maneuver, we might call this a deficit speed. If the deficit speed is measured just right in the beginning, the ship will drift inward in the solar system until it reaches the orbit of the faster-moving Earth, having picked up, while drifting, enough speed (much as a stone rolling downhill picks up speed) to match that of the Earth. And if the timing is right, the Earth will be in that spot, or very close to it. This sounds fine, but the trip is not yet over. The Berth has its gravitational field, too, and when the ship gets close, Earth wants to draw it down. But the Earth also has an atmosphere, which here is fortunate, for it is possible, by careful maneuvering, to utilize the atmosphere as a braking medium. If the ship were allowed to plunge straight into the atmosphere it would simply burn up, like a meteorite. But if it is made to just graze the outer layers, its speed will be reduced somewhat, without the ship’s being heated to a dangerous extent. Swinging out into space again it will cool off, radiating the heat away, and be ready for the next grazing. This will be repeated four or five times. Each time the speed will be reduced further, so that, in the end, the ship will be ready for landing. (By the time the first ship returns from Mars, this maneuver will be well known and well tested by pilots who have returned from trips around the Moon.) Once definitely inside the atmosphere, additional parachute-like “air-brakes” can be used. The first few may burn up; but each one, even if it is destroyed, will in the course of its use reduce the ship’s speed some more, helping it finally to approach the surface with reasonably slow speed. The final landing may need rocket help once more—but that will be rocket help without the collaboration of the atomic pile. It will be hydrogen gas burned with oxygen in the old-fashioned manner, so that the landing area will not be drenched with radioactivity. The exploration of space will be the next great chapter in the history of humanity, and it may be that this” exploration will help to avert future wars. Because when a man meets another man on the Moon, or on Mars, or on Venus, that man will no longer be a Frenchman, or a Russian, or a Chinese, but another man from Earth. The exploration of space will not begin tomorrow or the day after, but it is so close that most of the people now alive will see its beginning. In the laboratories scientists are hard at work on problems that already begin to yield. The race to the planets is on. The British Interplanetary Society is working at top speed to put a Made-in-Britain space ship on the Moon—first. On the following pages MI presents a summary of their program, obtained by Alfred Eris in an exclusive interview with officials of the Society in London. Here is a serious challenge to American rocket-men! BRITISH scientists are working at top speed on plans to conquer space and already have outlined a five-stage program to culminate in the voyage of a space ship to the Moon. The British Interplanetary Society has subdivided itself into research groups, the better to tackle the many different problems of space travel, and at the same which is a rotatable air-lock, which will spin in the opposite direction from that of the space station itself, to enable passengers to step from the ship into the station. Imagine the living quarters in the shape of a ring around the cylindrical powerhouse, about halfway up, and from the living quarters, attached by means of spokes, an annular ring, parabolic in shape. The other end of the powerhouse culminates in steam coils, surrounded by a wide annular ring, smaller than the first but also acting as a parabolic reflector to trap the rays of the sun. The intense heat generated thereby can be counterbalanced by “cold coils” on the back of the annular rings, which will be in perpetual shadow and intensely cold. The auxiliary powerhouse consists of a smaller power station with a parabolic mirror. The observatory has neither rejectors or rings. Conditioned air and electrical power are supplied by cables stretching like tentacles from the first two units. All three parts of the station will be aided by small jet-propulsion units to swing on their own axes at the distance considered most convenient, 150,000 miles from Earth. Turbines on the space station will be spun by nitrogen. There will be no loss of this gas as the units will be working in a closed cycle. The space station is expected to be built piecemeal by parts brought up from the Earth. Centrifugal force will maintain it if its orbit between the Earth and other olanets. British scientists consider the space station of paramount importance for, as always, the prime problem is fuel. No other factor is expected to be half so troublesome. If atomic energy can be utilized, their worries will be just about over. Failing that, they look at current research statistics and shudder. For figures now available indicate that a round trip to the Moon, including a landing there, will require 229 tons of fuel for each ton of payload. If no landing is made, the amount will be cut by 60 tons. These figures are based on the best propellant available today, a combination of liquid oxygen and liquid hydrogen, which will yield a speed of a little over three miles per second. But, obviously, the consumption of fuel is based on the chemical energy of the fuel, and if a small atomic-energy unit can be harnessed the boys will have no cause for weeping. Radio communication between Earth and the space station will be simple. A beam of only 50-watts power is considered ample, as there is no attenuation with distance in a beamed signal, and the space station will obviously be in the direct line of sight. •The British space-travel enthusiasts were delighted to hear, recently, of the assertion by one of the foremost German rocket men, Von Braun, that the Germans were working on rocket space ships and expected them to be in use in 10 to 15 years. This period they hope to cut down considerably by intensive work carried on right now by research groups throughout England. For the sake of efficiency, the Society has organized research sections under the following classifications: Orbits (involving their best talents for mathematical calculations and computations), Fuel, Electronics (including Instruments), Structures, Motors, and Nozzles. Opening their great scheme of interplanetary exploration will be a flight to the Moon. Since the Moon’s low gravitational influence (about one-sixth that of the Earth), will require much less power for the space ship to free itself of its field, the Moon suggests itself as the ideal jump-ing-off spot for voyages to Mars and Venus, next on the itinerary. The voyage of 240,000 miles to the Moon is expected to be nowhere near as formidable as it sounds, once the fuel problem is solved more satisfactorily. Driven by chemical reaction units, the space ship could do it in 48 hours. Venus, which is 26,000,000 miles at its closest approach to the Earth, is considered 48 days’ travel, and 90 days will be needed for Mars, 35,000,000 miles away. Atomic energy, harnessed and adapted specifically to rocket propulsion, promises the super-concentration of power which will bring travel to the planets down to a matter of hours and not days. The space ship will make ample use of radar in altimeters and meteor detectors. Although hitting a meteor is a distinct possibility, the mathematical chances are so minute that the scientists refuse to worry about them. To deal with the effect on any space ship of the intense heat on one side and the extreme cold on the other, the British machine will rotate in its flight at the rate of three revolutions per second. Communication between the space ship and Earth will be by means of ultra-short-waves beamed directly, as between the space station and the Earth. The approved design for a space ship provides for a cylindrical rocket with a control chamber in its nose for a crew of three astronauts, or space travelers. The ship will be powered by main and auxiliary jets, the whole propulsion system having a honeycomb design and the firing of the rockets in series being under the control of the crew, who will regulate the rate of ascent- so as not to accelerate at a speed which might be injurious to the human body. As it spends its rocket tubes, the space ship will jettison them. When nearing the Moon, the auxiliary jets will very gradually be employed to turn the ship over, so that the landing is made stern first, in position for the takeoff. Landing will be made by the power of the main jets. On their return to Earth, the astronauts will detach the nose part of the rocket with its equipment, and it—and themselves—will be landed by parachute. The astronauts will, of course, wear conditioned suits specially built to withstand lack of atmosphere and extreme cold. It is thought that any leading manufacturer of high-altitude equipment in Britain could take the specifications and make their space suits to order. The question of the effect of almost unthinkable speeds [Continued on page 162] upon the human body has already been studied. It is found that the body is not affected by velocity, but by too violent acceleration. The space ship will be designed with fully controlled propellants so that the rate of acceleration is not permitted to impose a fatal strain upon the occupants. Again, the use of atomic power should permit of a gradual building-up of the acceleration, with no adverse effects upon the astronauts. The British Interplanetary Society is over 300 strong, composed of engineers and scientists, in distinction to now-defunct similar organizations consisting of dreamers and theoreticians. Work on space travel is kept at a high pitch. Come what may, they are resolved that the lunar equivalent of Paul Revere will some day shout, “The British are coming.” American rocket workers they dismiss with a smile, as toiling in an unscientific fashion. They describe the Americans as building rockets first, firing them, then wondering why they went wrong. They are not intimidated by United States Army Air Force missile experts who are quoted as saying they expect to be able to shoot a rocket to the Moon within 18 months. 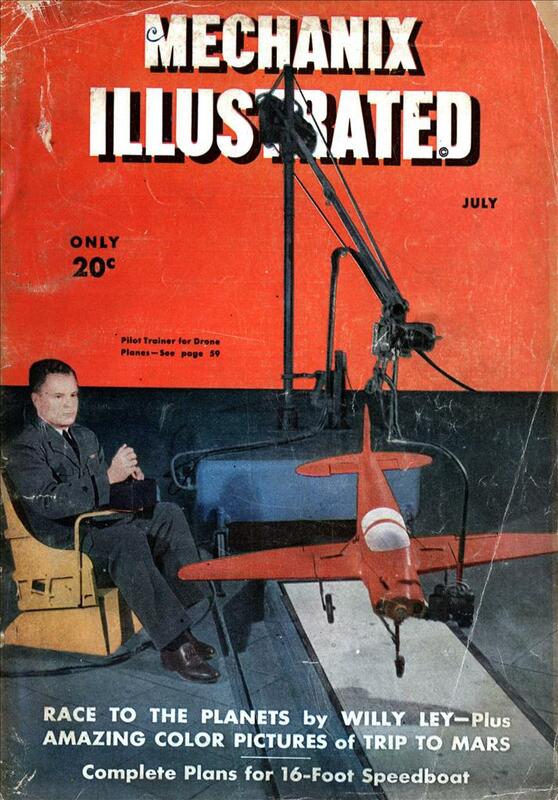 British rocket men point to British achievement in radar and other developments, considered by the uninitiated as pure U. S. inventions, and feel that their lead in space travel should be taken as a matter of course. If we’re ever going to send people to the outer planets, we’re almost certainly going to have to use nuclear propulsion of some kind. Sigh…. remember when we looked to the future with optimism? Toronto, I saw that too! The X-15 was launched from a B-52. Spaceship One was launched from White Knight. A huge Thunderbird-esque jet would make a nice launch vehicle for future reusable spacecraft. Scott… already some of the space probes are using ion-propulsion. The first was Deep Space 1, but it was solar powered. Here is an interesting article on how they proposed space travel to the next solar system in 50 years travel time.